If you’re fortunate enough to be a resident of the great state of New York, then refinancing your home doesn’t have to be as expensive and difficult as it normally is. Whereas most purchasers in the U.S. have to pay the full value of closing costs consisting of loan origination fees, appraisal charges, and credit report costs, buyers of New York are able to save money under CEMA, which stands for Consolidation, Extension, and Modification Agreement. When is CEMA not an option? 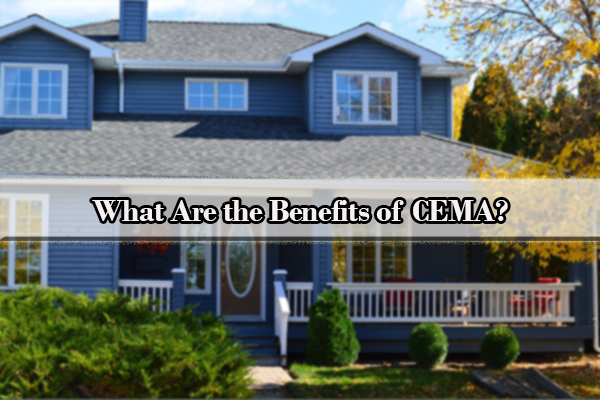 What are the benefits of CEMA? How do I get a CEMA? What can a CEMA lawyer do to help? CEMA stands for Consolidation, Extension, & Modification Agreement. CEMA type loans can only be done in New York State. A CEMA loan is an agreement between the existing Lender and the New Lender to combine two or more loans into a new, consolidated loan. This is commonly used by existing homeowners who wish to refinance their home or prospective buyers looking to save on mortgage taxes. Generally, if the homeowner is planning to refinance their existing first mortgage and has previously paid the New York State mortgage tax, CEMA will allow the homeowner to pay the calculated NYS mortgage tax only on the new money or additional amount above what was originally borrowed. Accordingly, rather than pay the state and local tax on the amount of the mortgage, with a CEMA loan, you’re only paying the tax on the difference between your mortgage amount and the previous loan amount. For example, if you have a $200,000 mortgage and are refinancing with a $300,000 loan and live in New York City, you would ordinarily have to pay a tax of $300,000 x 1.8 percent (2.05% minus .25% percent paid by lender), or $5,400. With a CEMA loan, you would only pay the 1.8 percent tax on the difference of $100,000, meaning a tax of just $1,800. No cancellation will be filed on the existing mortgage, and the homeowners’ credit report will reflect the new CEMA mortgage and will report the existing mortgage as transferred. Purchase CEMA mortgages are only an option for purchases of one to three family houses or single residential condo units. Accordingly, a co-op apartment does not qualify for CEMA because such real estate is not considered real property; instead, it is considered personal property. In addition, CEMA is not an option on loans considered to be Home Equity, HELOC, or Second Mortgages, or for mortgages being discharged. CEMA only applies where a mortgage recording tax is applicable and therefore when it comes to paying the mortgage recording. CEMA loans help save money for those attempting to refinance their home because clients only have to pay taxes on the amount of the new loan that is above and beyond their current unpaid principal balance, otherwise known as “PUB,” such as closing costs or cash out. When it comes to recording a mortgage, otherwise known as the Mortgage Recording Tax in NYC, buyers are charged 2.05% of the borrowed amount for new mortgages below $500,000; the rate increases to 2.175% of the borrowed amount for new mortgages over $500,000 for 1-3 family residential units and individual residential condo units. Larger multi-family and commercial properties with new mortgages over $500,000 have to pay 2.8% on the borrowed amount. Because the mortgage recording tax in NYC is only taxed on new borrowings, the buyer will only have the pay the mortgage recording tax on the difference between the new mortgage and the seller’s existing mortgage principal. For example, assuming that a person had a loan amount of $300,000.00, financed closing costs of $8,000.00, and a county tax rate of 2.05%, without a CEMA the loan amount of $300,000.00 x 2.05% tax rate would equate to $6,150.00 total tax. However, with CEMA, the financed closing costs of $8000.00 x 2.05% tax rate would equate to only $164.00 total tax. In order to start the CEMA process and transfer taxes, you should consult with an expert familiar with CEMA to determine if you qualify and if CEMA is the best option for you. Generally, however, in order to qualify for CEMA, you have to be dealing with real property, either homes or condos. This is because CEMA is only applicable where there is a mortgage recording tax, which is what CEMA is trying to avoid. 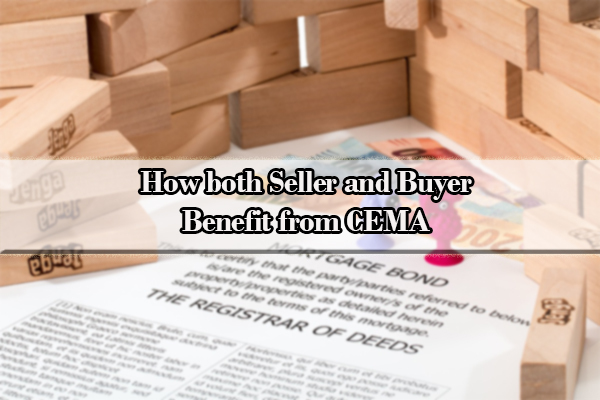 Another qualification is that both the original lender and the new lender are willing to cooperate with each other and consent to the CEMA. Lastly, the seller of the property also needs to agree to the CEMA. Since CEMA may take longer than normal to refinance, as it can be a lengthy process depending upon the speed at which the bank attorney and original lender and/or their attorney, are willing to cooperate. As such, it is highly recommended that you communicate your interest or desire for CEMA early on in the refinancing process. While CEMA does save you money in many cases, it’s not necessarily the quickest process. The state of New York and any previous lender must do some special signing off in order to get the mortgage and title transfers processed under CEMA regulations, allowing you to pay taxes only on the new money in the transaction rather than the full principal balance. In fact, in New York, it may take anywhere between 60 and 90 days to close your loan. Theoretically, although CEMA is supposed to save the person refinancing money on reducing the amount of their mortgage, there are fees involved. Each lender, and its respective bank attorney, will have CEMA fees. These fees vary and should be determined as early as possible in the loan application process to make it possible to make a good decision whether it makes sense to proceed. Specifically, if the payoff lender and the new lender are not the same, then that means two banks plus two attorneys equals four different fees. Typically, these fees range between $450 and $1100 each. Therefore, the total of these fees can range from $2000 to $4500. Accordingly, this total should be considered as an offset to the mortgage tax savings. In addition, if the refinance takes place less than 10 years from the previous one, or they have owned the property (without any deed changes) for less than 10 years, the home owner qualifies for the refinance title insurance rate, which is usually less than the typical fees. Either way, you should consult with an experienced CEMA expert who can advise you what the probable costs would be and if CEMA is in your best interest. Q: What is a CEMA mortgage loan? 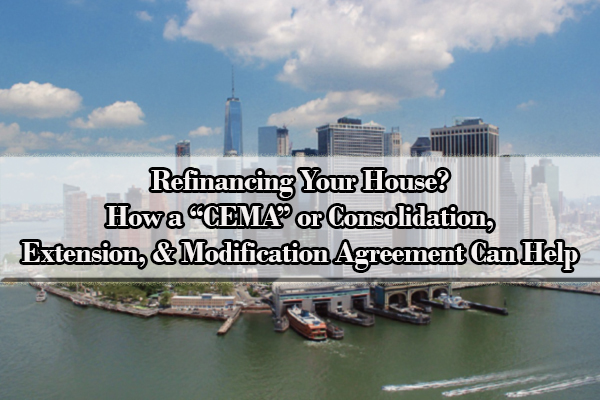 A: CEMA stands for “Consolidation Extension and Modification Agreement.” The purpose of CEMA is to avoid paying part or all of the New York mortgage tax, usually on a refinance transaction, but sometimes on a purchase transaction. Q: Why doesn’t everyone utilize a CEMA? A: In order to start the CEMA process, borrowers must sometimes pay an upfront fee to their existing lender. Since this fee may be non-refundable, even if you do not complete the refinance, some people may not want to engage in the CEMA process. Q: What is the formula for calculating the tax savings with a CEMA loan? A: There are two basic methods. The first method involves a four-step process. The second method is only two steps. Both, however, will give the same result. Step 1: Take the principal unpaid balance or “PUB” from payoff loan. Multiply that figure by the county tax rate. Step 2: Subtract Bank and Recording Fees. This shortcut works because the purpose of a CEMA is to give borrowers a credit for mortgage taxes paid but not “used” as represented by the PUB of a mortgage at the time of payoff. Imagine that you have a borrower who wants to take a loan for $250,000. Imagine further that the borrower’s prior mortgage was recorded in the amount of $200,000 and that they paid the full tax on that mortgage. Now imagine that at the time they refinance, there is exactly $192,153.35 left on the mortgage as the PUB. A CEMA loan allows the borrowers to take an exemption in the amount of $192,153.35. Q: What is the cost of utilizing a CEMA? A: Each lender, and its respective bank attorney, will have CEMA fees. These fees vary and could cost several thousands of dollars, so CEMA fees should be determined as early as possible in the loan application process to make it possible to make a good decision whether it makes sense to proceed with CEMA. Q: Do you have to pay NYS mortgage tax on a refinance? A: New York charges a NYS mortgage tax or specifically a recording tax on any new mortgage debt. This rate varies by county, with the minimum being 1.05 percent of the loan amount. But fortunately, homeowners aren’t required to pay the tax again once they refinance. When it comes to dealing with the NYS mortgage tax, a CEMA lawyer or law firm is crucial when you are refinancing your home in New York. CEMA may help save money by significantly boosting your chances of being able to pay a lower mortgage recording tax than what you normally would. If you are refinancing or even just considering it, you need to consult with an experienced CEMA attorney to discuss the benefits and drawbacks and whether or not it is in your best interest. 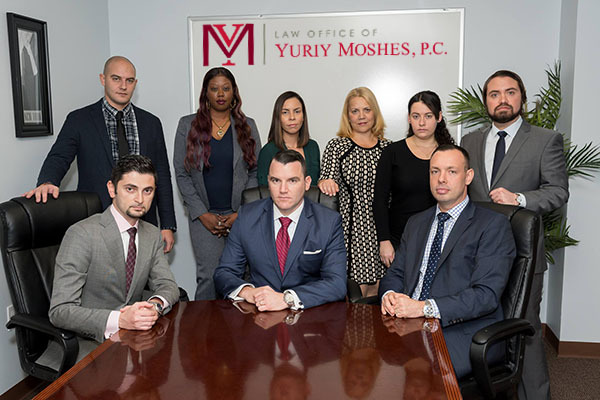 The Law Office of Yuriy Moshes has the experience and knowledge to provide this for you. We are in the greater New York City area including all its boroughs, including Manhattan, Brooklyn, Queens, the Bronx, and Staten Island) as well as Northern New Jersey, Long Island, and Upstate New York.